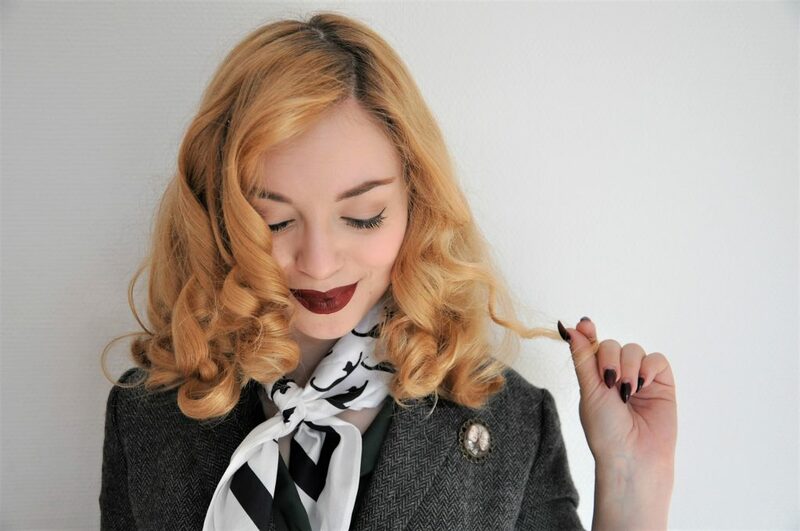 In this 1950s styling tutorial I will show you how to dress and style your hair like an androgynous, self-confident Teddy Girl from the British capital. 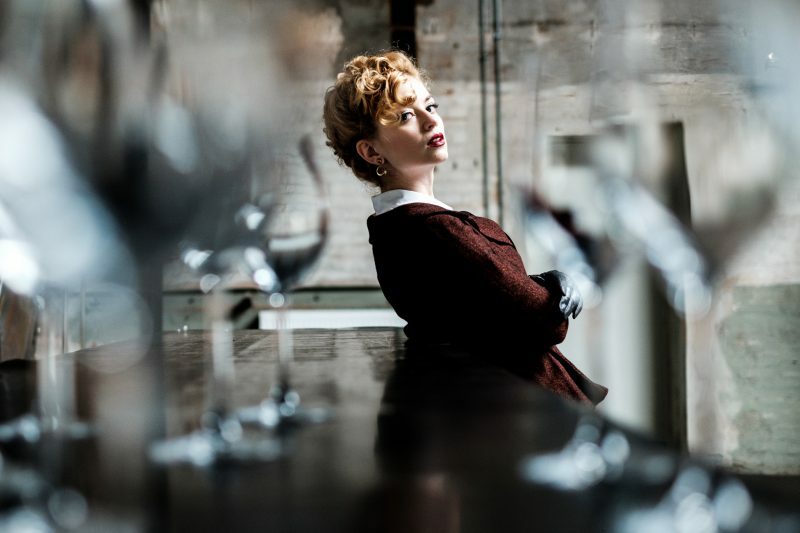 Den deutschen Beitrag zum Thema findest du hier: 50er Jahre Styling – Frisur und Look der Teddy Girls. The way these teenage girls expressed themselves in the 1950s was completely inappropriate for young women in society. Teddy Girls showcased themselves as strong, stylish, androgynous young women wearing pants and suits, living life by their own rules. Ken Russell, who photographed a group of Teddy Girls, in the 1950s. In my last post on the Teddy Girls I wrote about the backgrounds of this youth subculture, which even was the first female one in British history! I introduced the male counterpart, the Teddy Boys, and the reasons for their unique way of styling. 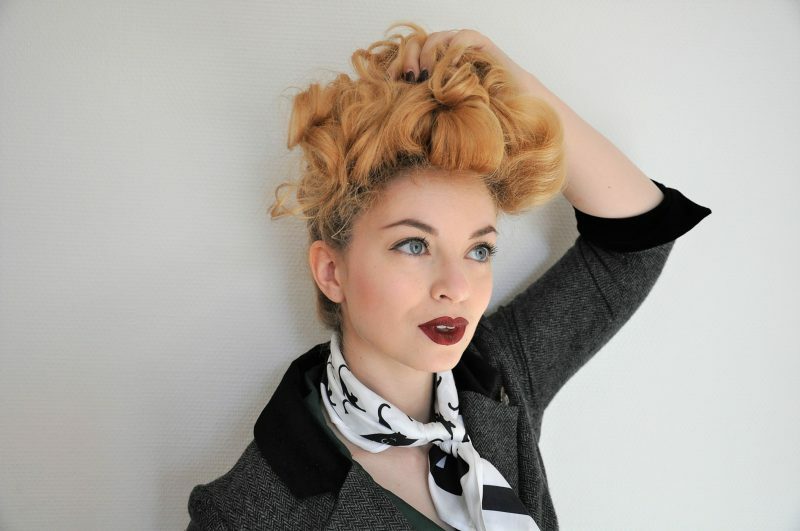 To continue my Teddy Girl series, I am now going to take a closer look at the styling of these girls. 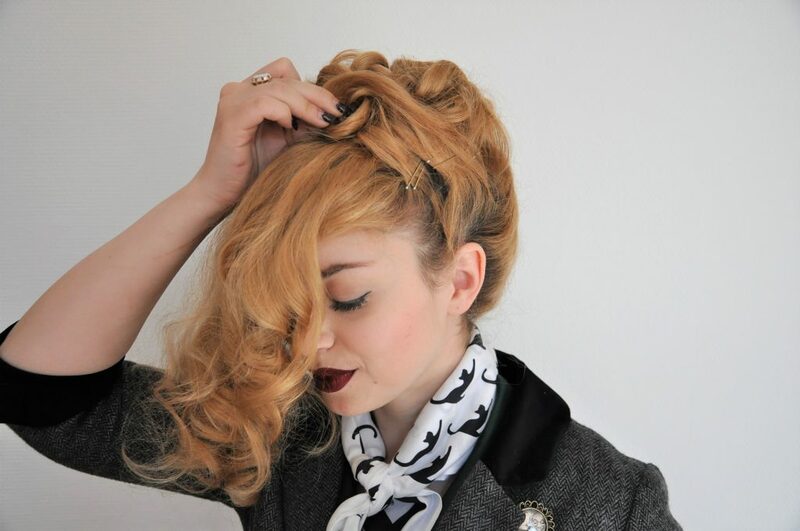 And show you how you can create your own Teddy Girl hairstyle – just like I did in my photos with Robert Strehler. Young men and women rediscovered Edwardian suits as their fashion statement – the same garments that their grandparents used to wear half a century and two World Wars before. Even more significant than the Teddy Boy’s subversion of upper-class clothing and the Edwardian fashion, was the girls’ interpretation of masculine styles. 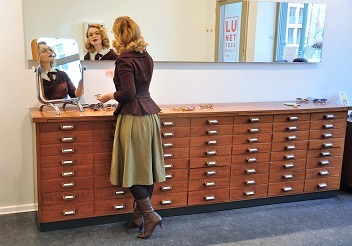 In the time of the 1940s and early 1950s pants were mostly worn by women during the war or at work. 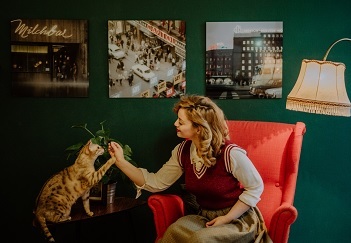 The 1950s styling is known for women emphasizing their silhouettes, wearing figure-skimming skirts and welcoming the feminity of tight, pencil-shaped dresses. Meanwhile, the Teddy Girls continued the adoption of menswear for women. Despite their non-conformist style and rebellious attitude, photographer Ken Russel „(…) never thought of those kids as anything but innocent.“ He explained they all dressed up, were quite edgy, and they were more relevant and rebellious — but still were good as gold. They thought it was fun getting into their clobber, Russel said. „As mutation of the Teddy Boys developed the Teddy Girls“, explained the German magazine ‚Der Spiegel‘ in 1955, that reported about the 1950s subculture in a very contemptuous way. The Teddy Girl dressed masculine, adopting styles from their male group as well as adding some of their own, individual and female accessories. The base of the style was a boxy, single-breasted jacket or drape jacket with a velvet collar. 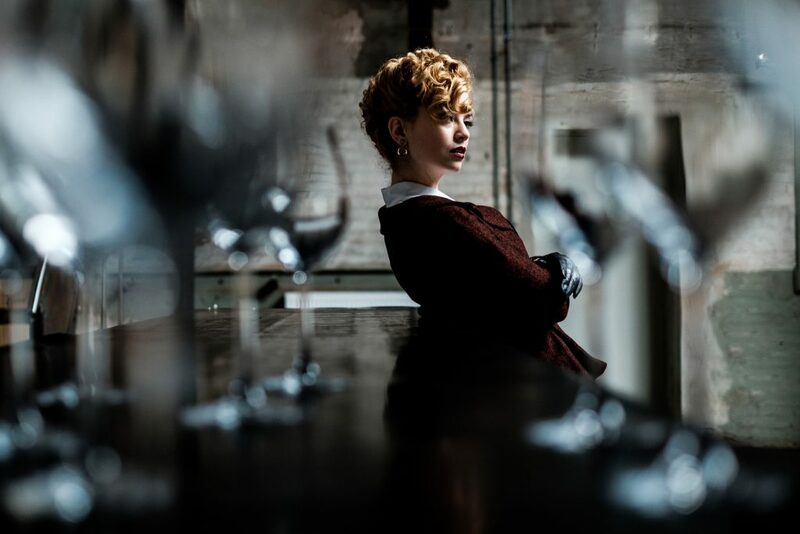 This is also why Anne from Gracy Q created with her Teddy Girl inspired collection some jackets, named „The Teddy Coat“, with velvet collars and a slim shape. In the photos I show another typical Teddy Girl element, the white blouse, which is here decorated with satin buttons and a black satin ribbon as a bow – such as the girls wore as well. 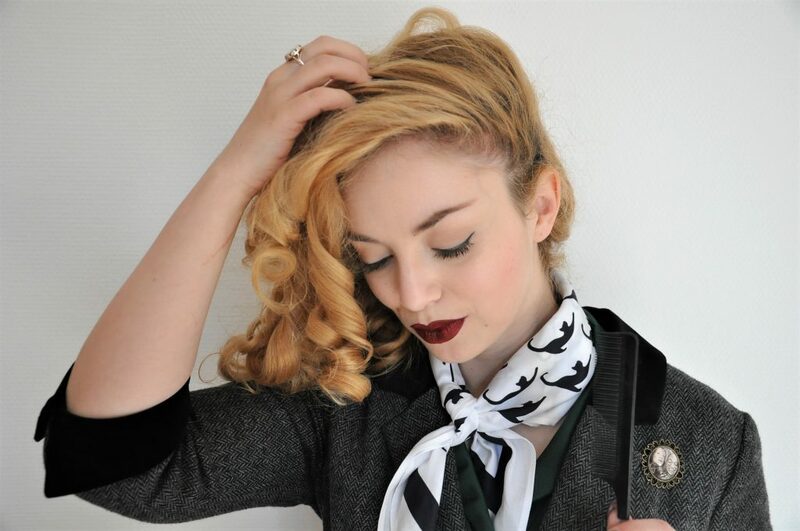 A typical Teddy Girl 1950s styling: A white blouse with a black ribbon. All these garments were created by Gracy Q fashion, who did a Teddy Girl inspired collection this season. The photos were kindly taken by Leipzig based portrait photographer Robert Strehler. The bottom wear for the Judies‘ fashion was quite diverse: They wore either a straight skirt, a hobble skirt (a typical floorlength, Edwardian feature) or wide pants. Some of the styles turned it into a little more female look with shorter, waisted jackets – such as the beautiful Notting Hill Jacket by Gracy Q that I am wearing in the photos – voluminous circle skirts or tight pants, just like rolled up jeans. The girls added their own individual features: Black and white gloves, bangles, luxurious earrings, cameo brooches, fancy socks, straw boaters or long and elegant clutch bags are only a few examples worn by the Judies. Of course a cigarette stub in their mouths was a popular accessory for the rebellious young women as well! And they even wore coolie hats! “She was auburn-haired and fifteen. She wore tight-fitting trousers, a sweater, and brightly coloured socks. And she carried a small dagger.“ The Daily Express described a Teddy Girl that got into a fight in 1954. Footwear could diverge between flat Oxfords, Roman sandals or espadrilles, low heeled pumps or ballerina shoes. Moreover, Teddy Girls were rarely seen without an umbrella – which was rumored they never opened, even in pouring rain. Some typical Teddy Girl accessories: An umbrella, hoop earrings and gloves. I wear a simply straight skirt made of velvet, again by Gracy Q. The shoes I found here*. The youth groups were not always easily defined as the more famous Teddy Boys. Some of them wore trousers, some had skirts and other Teddy Girls would wear ordinary clothes, simply accentuated with Teddy related accessories with 1950s variations. So as you could just read, the fashion of the girls was truly diverging, and is so easy to style nowadays. 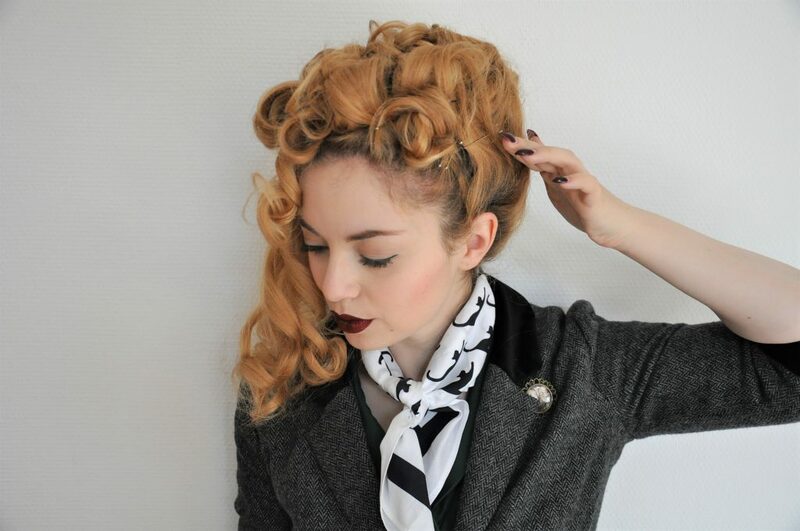 The typical Teddy Girls hairstyle was curly and short. Some girls had short hair, others would slick it back or wear like a messy 1950s poodle hairdo. They mixed the looks of punks at that time with the ones of the American Rock’n’Roll icons, which influenced the Teds since their rising popularity in Great Britain. 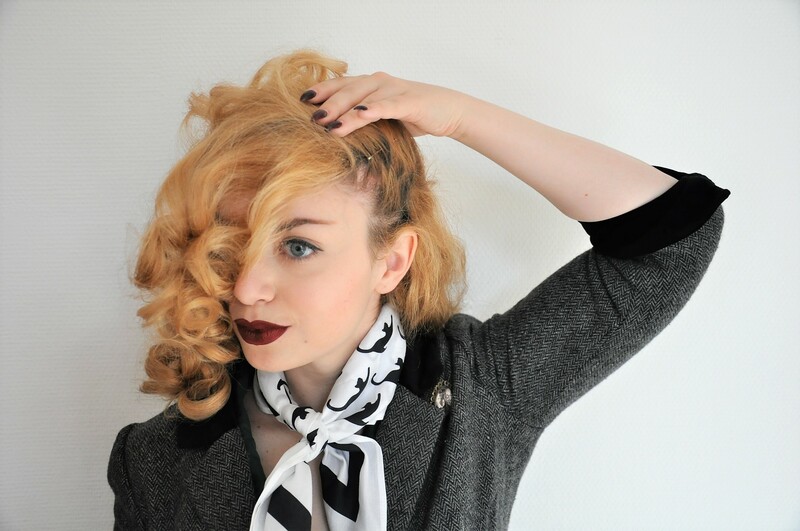 In this photo tutorial I would like to show you step by step the 1950s style that I did for my photoshoot with Robert Strehler. My hair is quite long and thick, so it might be a bit more difficult for me to create than for someone with shorter or thinner hair. But in general the concept of this style is quite easy – to pin curls on the top of the head and keep the side parts tighter. Make sure you have lots of pins! 1 The first step is the preparation. I usually curl my hair over night, as I do not like to use heat and it is faster to style in the morning. I use foam rollers, but you could also do pin curls! Some hair mousse before curling is also quite helpful to make sure the curls will last longer. 2 Now we prepare the base for the hairstyle. This means we create a circle of hairpins around the top part of our head (leaving out the forehead), pinning the hair straight to the skin. I start with combing it to one side and using pins, one next to another, to pin my hair straight to the head. The ends stay lose first. In the lower photo you can see the step. At about this height I create a circle of pins around the head, pinning the hair up lose. By the way: The cute kitty scarf that I wear is also an accessory made by Gracy Q, to complete the look of the collection in a Teddy-ish manner. 3 This is how my hair looks in the end of this step. Now I have an amount of curls hanging lose, which have to pinned closer to the head step by step. I always start with the back. 4 Start pinning the curls to the back of your head. I use my index finger and curl a strain over it to pin it on the head. Don’t pin them lower than the circle you created before, this is your line telling you, what form the style shall have in the end. In this photo you can see my pin circle on the side and how I do the curls above. It will look a bit messy in the beginning, but don’t be too careful or doubting. In the end you can adjust each single one of them, in case they stick out of your updo. And sometimes the beginning seems a bit confusing, but in the end all works out well! 5 Afterwards I continue pinning the hair on top of my head. I do the side parts in the end, to create some lovely blendings. On your forehead you can leave out one or two curls. These are the ones hanging over my face in the photos. This makes the updo look a little more rebellious. 6 In the end, after I pinned up all the curls, I have a look around, which pins from my circle in the beginning seem to attract attention and are not neccessary for the style anymore. Such as these in the back. Some of them I can take out again. If there are any curls standing out, you can now improve them as you like to make the picture harmonious. But always remember that everytime you do curls they will look totally different, as well as your updo will. In general I am not a perfectionist in matters of hairstyles. I love hair that looks natural and not too sleek or on point. 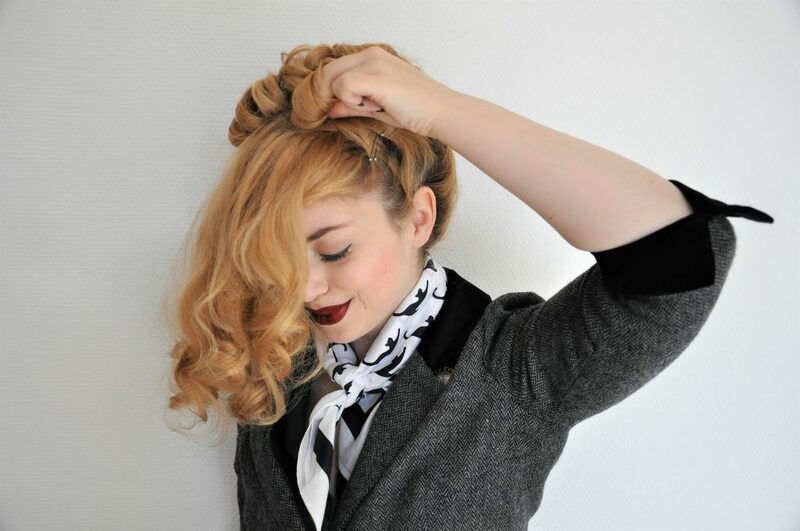 I do not care about some visible pins or a strand of hair not being super perfect in place – in my opinion this is every day life and we should be able to move and live comfortably with this hairstyle! This is the final look that can now be fixed with tons of hairspray. My curl on the front is a bit thinner than the one on the shooting photos (it is one and not two strains this time), but this can vary as you like! It only depends on the amount of hair you leave hanging out of the updo. I hope the tutorial worked well for you and I would love to hear your feedback, maybe you also have a question on the style, or would like to show us the result of yours! 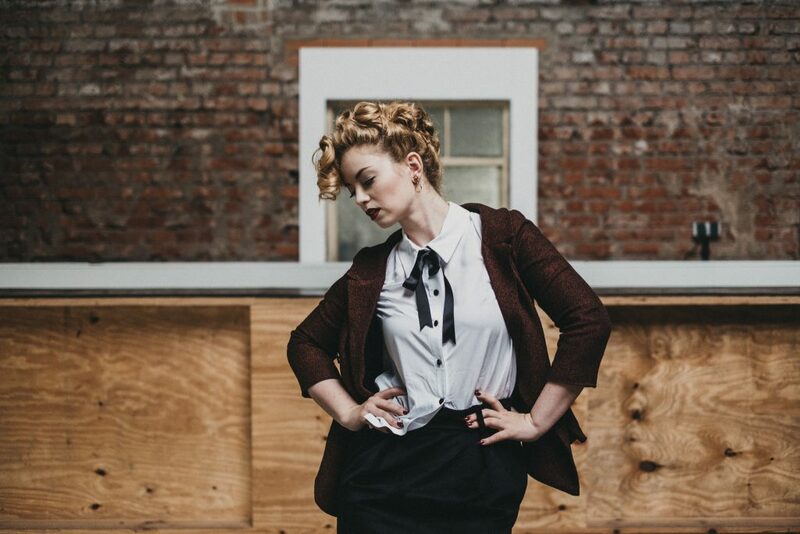 This is how it all comes together in the end for a perfect 1950s styling à la Teddy Girl. The garments, accessories and hairstyle. I absolutely adore the look of the Teddy Girls and will definitely continue wearing this in my everyday life. It makes a woman feel strong, rebellious and powerful. Just the way it has to be. Thank you Gracy Q and Robert Strehler for your support, as well as Kunstkraftwerk Leipzig for this wonderful industrial location! *In this post I used an affiliate link. In case you buy something via this link I will get a small percentage of the profit. This does not change anything for you, it simply helps me to maintain my website and keep it free from banners.